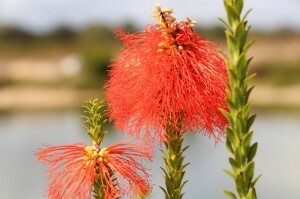 This is the first “bottlebrush” type flower to appear on the property. We have planted hundreds of different Australian natives around the property, and we have a huge variety of different orchids and other flowers, but this is the first one with this type of flower. We have planted quite a few of these shrubs round the dam, so I look forward to seeing more of these vivid, red, splashes reflected in the water.